You’re about to spend a lot of money on a new roof, but you don’t know enough about roofing to make an informed decision. Even after you’ve checked out the websites of a number of Calgary roofing companies and read customer reviews, you’re still not sure which one to choose. Relax, you’ve found a friend! Our website has a ton of information on all the elements of the roof system along with valuable tips and advice, including how to choose the right Calgary roofing contractor. We want you to have the best experience possible when getting a new roof, so please read as much as necessary to help you make your decision. Here’s a secret: we’re not really in the Calgary roofing business! We’re in the business of making your life easier! We do that by solving your roofing problems with the same passion and caring attitude you have when you’re helping your best friends. At every stage of your job, from first contact to final cleanup, we try to make you feel like you’re special. Because you are. Without you, we wouldn’t be in business! That’s what drives us to provide not only the best customer service, but the highest quality installations. To accomplish these goals, we do three extremely important things that make us unique in the industry. When you hire us to do your roofing, Calgary, we believe it’s unethical and unprofessional to sub the work out to someone else. We only use our own employees, who are trained to our high standards. Read more about why subcontractors may not be the right choice. Most roof leaks are not due to shingle failure, but to flashing problems. What the heck is flashing anyway? Click here to read more about flashing and why it’s the single most important part of a roofing system. 3 We Specialize in You! Unlike other Calgary roofing companies, our specialty is working directly with homeowners, not with insurance companies or builders. In addition, we focus on installing asphalt shingles for residential projects. It’s all we do. Learn about the advantages of using a specialist. 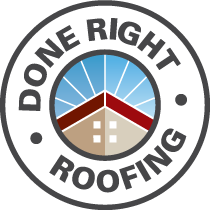 And remember, Done Right Roofing offers an industry-leading Lifetime Installation Warranty, for added peace of mind. We hope to be on your roof soon! We specialize in asphalt roofing for residential installations. Learn more about our roofing, roof repairs, and other services for Calgary homeowners. Our experts can repair any problem. We’ve fixed leaks that left everyone else stumped. Here are some tips for leak detection and information about our repairs division. Your roof is more than just a bunch of shingles. Learn about the six elements that you must consider for a problem-free and worry-free installation. Your roof is a major investment. Learn how to protect it and avoid costly repairs from damages due to ice damming, ventilation, and other causes. When hiring a roofing contractor, it’s important to know they’re following the Alberta Building Code. We’ve summarized the major requirements so you know what to ask when getting quotes. We’re happy to inspect your roof and provide your insurance company with a letter of our findings. Read this section is you’re interested in discovering the most common misconceptions about insurance claims. According to the Better Business Bureau, roofing contractors generate some of the highest rates of inquiries and complaints. We’ve put together comprehensive checklists and resources to help you make an educated choice. Protect yourself when hiring a roofing contractor. Understand the difference between estimates and contracts and find out the licensing and insurance requirements for roofing companies. Do We Provide the Best Roofing in Calgary? Judge for yourself! Read the top 20 reasons to choose us for your roofing project. You’ll also learn what to expect when you hire us and see some of our many great customer reviews. We’re a different kind of roofing contractor, committed to quality and constant improvement. Check out our blog for tips, advice, and other information on a variety of roofing topics. We’ve installed thousands of roofs in Calgary and surrounding areas. Chances are good that we’ve done several in your neighbourhood, and maybe right on your street. But our gallery is pretty new and has a limited number of photos. Bear with us and, before you know it, you’ll find a photo of a home that’s a lot like yours. Looking for work? Find out why working at Done Right Roofing is a career and not just another dead-end job. Our employees are part of the family, they’re well treated, respected, well paid, and take pride in their work.